This page will be dedicated to antique air powered weapons. The First book in a series entitled The Construction and Operation of the Air Gun. Volume 1 The Austrian Army Repeating Air Rifle. The Inventor of the Austrian Service Air Rifle, Bartolemeo Giradoni, was born 30th May 1774 at Ampezzo in the Southern Tyrol. Although primarily a Clock Maker, He possessed a strong interest and ability in firearms design, and was responsible for a number of proposed improvements to the basic Flintlock mechanisms in use at this time. Amongst these improvements, was a design for a repeating Flintlock gun with a breach loading system that in principle was successful but had to be abandoned due to the insoluble problem of hot gas erosion causing the rifle to fail. When considering this problem Giradoni eventually concluded that the solution relied on the combination of the successful mechanical elements of his design and a non-volatile power source. The only alternative to gunpowder at this time was compressed air, and the use of this as a viable technology, was already well established in the bespoke sporting Airguns of this time. When Giradoni combined the reliable repeating features of his Flintlock design, with the established Airgun Technology of this period , a completely new weapons concept was created. 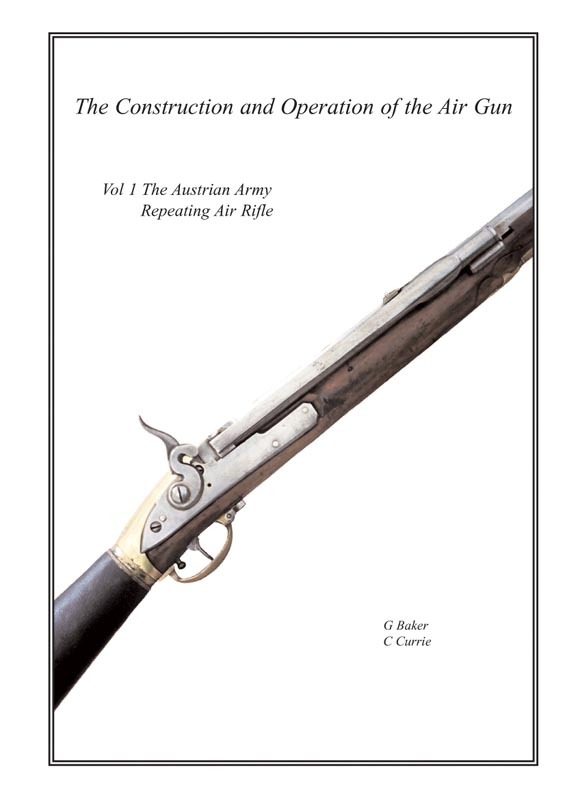 If you want to know more about this fascinating rifle and its ingenious mechanism you will just have to buy this very informative book with superb detailed sketches by G Baker and C Currie. The Second Book in the series Entitled The Construction and Operation of the Air Gun Volume 2 The Walking Stick Air Gun. 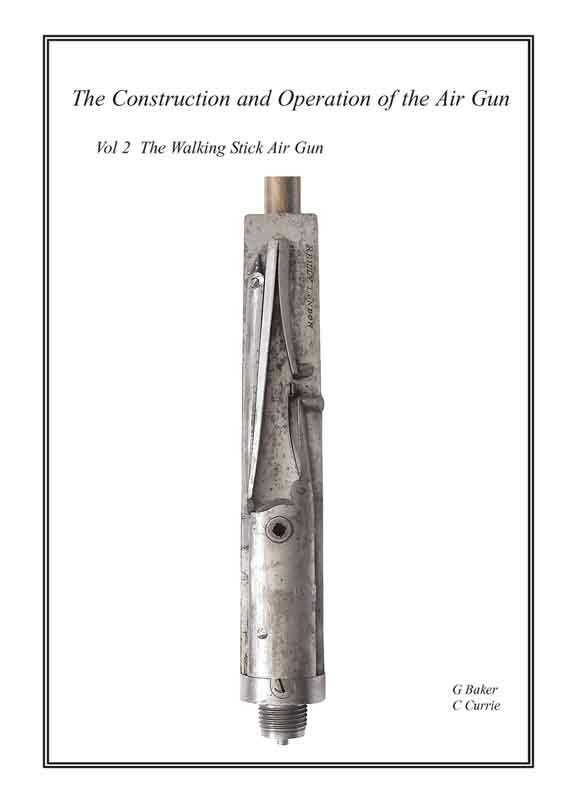 The subject of the second book in the series is that most unusual device the walking stick airgun, or aircane. Like many others, the authors were first introduced to them through the writings of Lesley Wesley and have retained a strong fascination ever since. Of course the concept of disguising a firearm or blade in a walking stick is not a novel one and the variations are legion. However concealing something as complex as a pneumatic weapon, within the constraints of a walking stick, is a different concept altogether. Given that the aircane was both made and used in significant numbers during the Victorian period, it is surprising there is very little contemporary or subsequent documented history. Perhaps one reason the aircane has not attracted the academic attention that it is due, is that unlike a firearm, its real interest is concealed behind a rather uninspiring exterior. No one however, who removes the outer casing from an aircane, can fail to be astonished by both the mechanical complexity and superlative Victorian craftsmanship that is revealed. If you want to know more about these fascinating and ingenious mechanisms you will just have to buy these very informative books with superb detailed sketches by G Baker and C Currie .